Jessica Captain, right, of East Orange, N.J., attends a job fair sponsored by Swissport, Feb. 6, 2013 in Newark N.J. Swissport International, the world’s largest aviation services group, was hiring up to 1,000 employees for a new facility at Newark-Liberty International Airport. WASHINGTON - For the last 38 years, the National Urban League has issued a report on the State of Black America. And each year it finds a new way to describe the deteriorating status of Black (and now Latinos as well) people as compared to Whites in economic terms in this country. The National Urban League’s report on the State of Black America. 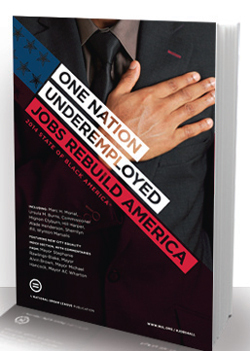 This year’s report, called “One Nation Underemployed: Jobs Rebuild America,” noted that not just unemployment—a term which is very familiar when it comes to economic analysis—but the underemployment rate for Black workers is 20.5 percent, compared with 18.4 percent for Hispanic workers and 11.8 percent for White workers. Underemployment is defined as those who are jobless or working part-time jobs but desiring full-time work. It also comes as no surprise, the report also said Blacks are twice as likely as Whites to be unemployed. 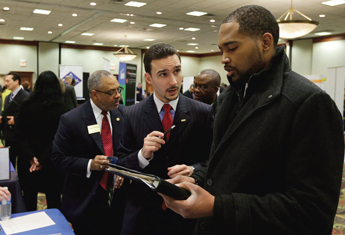 The unemployment rate for Blacks was 12 percent in February, compared with 5.8 percent for Whites. 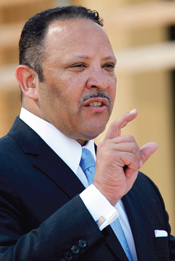 “Many Americans are being left behind, and that includes African-Americans and Latinos who are being disproportionately left behind by the job creation that we see,” National Urban League President Marc Morial said. 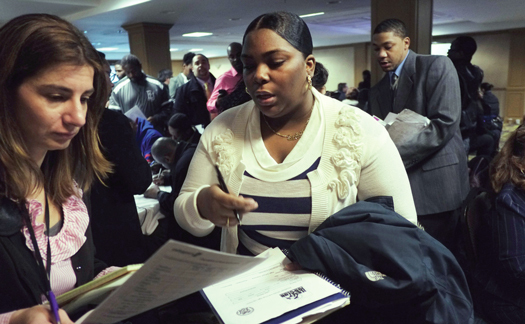 Even as the economy continued to crawl out of the Great Recession of 2008 this March, unemployment stayed steady at 6.7 percent, and Blacks fell farther behind as small gains were achieved. According to the new March 2014 jobs report 192,000 new jobs were added as the number of private-sector employees rose past their January 2008 levels, when the recession began. Total employment is still 437,000 jobs short of its January 2008 peak, largely because governments at all levels are employing fewer workers, and they added no jobs in March. Unemployment has also remained at a steady 6.7 percent due to the fact that, though 503,000 Americans found employment in March, just as many more entered the job market with no success. The ratio of employed people in the total working-age population increased to 58.9 percent, the highest number since August 2009. The number of long-term unemployed also fell by 110,000, and the number of people discouraged in their job searches also fell, to its lowest number since March 2009. And yet Blacks and Latinos lost ground in the overall economic picture. “While ‘too big to fail’ corporations went into the bail-out emergency room and recovered to break earnings and stock market records, most Americans have been left in ICU (intensive care unit) with multiple diagnoses of unemployment, underemployment, home losses and foreclosures, low or no savings and retirement accounts, credit denials, cuts in education and school funding—and the list of maladies continues,” Mr. Morial said. “In gross terms, the difference in median wealth between America’s White and African-American households has grown stunningly large,” wrote Dr. Thomas Shapiro, professor of Sociology and Public Policy at Brandeis University in one of the report’s essays. “The wealth gap almost tripled from 1984 to 2009, increasing from $85,000 to $236,500. The median net worth of White households in the study grew to $265,000 over the 25-year period compared with just $28,500 for the Black households. The Great Recession of 2008 witnessed a massive real estate meltdown and mortgage-foreclosure gap which saw trillions of dollars worth of Black wealth evaporate. 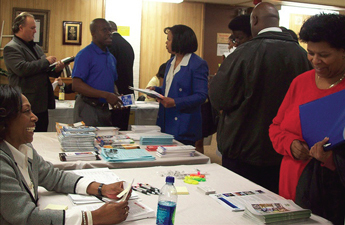 Robin Basil, left, of the Garland-Hill insurance agency talks with college student Markell Easter at the JobFairGiant.com employment fair in Dearborn, Mich. Despite the dismal numbers, an analysis by The Associated Press-NORC Center for Public Affairs Research found Blacks are significantly more optimistic about their future standard of living than Whites, regardless of income level, education or political party, even among Black who are convinced that racism is a cause of income inequality. Overall, 71 percent of Blacks surveyed in the 2012 General Social Survey agreed that they have a good chance of improving their standard of living, outpacing the share among Whites by 25 percentage points. Rather than a Black community which is “in denial” about its status in this country, such findings illustrate “a level of optimism in the African-American community and it’s important to lift that up,” said La June Montgomery Tabron, president and CEO of the W.K. Kellogg Foundation, which released similar findings in separate research. If there was full equality with Whites in economics, health, education, social justice and civic engagement set at 100 percent, the National Urban League said this year’s equality index for Blacks stands at 71.2 percent, little changed over last year’s index of 71.0 percent. However, the economic portion of the index dropped from 56.3 percent to 55.5 percent. The Urban League is pushing for several economic measures, including an increase in the minimum wage, an issue being debated in Congress as well as in several state legislatures. Democrats backed by President Barack Obama want to force election-year votes on gradually increasing today’s minimum wage to $10.10 by 2016, an effort that seems likely to fail in Congress. Republicans generally oppose the proposal, saying it would cost too many jobs. Can Black financial unity lead to job-producing solutions to the unemployment-underemployment-wealth crisis which has only worsened for Blacks since the height of the civil rights movement? “I have to tell you, it’s not something I would bet on,” said Dr. Bositis. “The problem is the most vibrant agricultural sectors in the country are not in the South. The Midwest and the Plains are much bigger areas in terms of agriculture and if you look at the price of land, the price of land there is way, way more than the price of land in most of the South. “Plus, you have to remember, vast areas of the South are going through droughts. People are killing off their herds of cattle. There are places where there is absolutely no water available. It hasn’t rained. Reservoirs are down. Even in the relatively short term, I just don’t see that as being necessarily an idea that’s going to have a big impact,” he said. Other analysts agree. The wealthy elites and politically powerful have forgotten about Black America and the poor in the United States. The Honorable Minister Louis Farrakhan has reminded us of how we can achieve the goal of collective ownership, asking each person to donate a nickel a day, 35 cents per week to help purchase farmland and to plant the seeds for future industry among Black people in this country. “That takes me to a quote from a speech that Dr. King gave, where he said: ‘No Lincolnian emancipation; no Keynesonian or Johnsonian civil rights bill is going to do this for us. We are going to have to do this for ourselves.’ I’m telling people that we’ve got to circle the wagons. That doesn’t mean that the government should not play a role, because it should. “I tell folks that the cavalry isn’t coming. Even with an African American president, it is obvious that the cavalry is not coming. (House Budget Committee Chairman) Paul Ryan’s (R-Wis.) latest proposed budget is what? Attacking Medicaid; attacking food stamps; attacking the social service programs that have been so vital in helping us move forward in this country, and now, those things are under attack,” Dr. Leon continued.